~ Johanna, JP & Jack the Black Cat! * Photo taken in our home.... Jack's at the table wearing his latest Halloween hat and acting a bit mischievous at that! 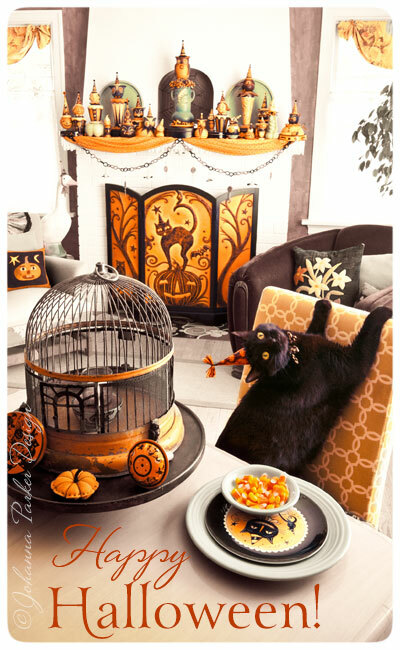 Fire screen & Halloween collectibles across mantel are all one of a kind Johanna Parker Design creations. JOL pillow & woolen pumpkin pin cushion are handmade gifts from mom (Kathy Parker). Illustrated black cat plate by Johanna Parker (me)..... Vintage noisemakers are cherished gifts from dear collector friends..... What fun!